So this time last week we didn't know that there was going to be a Ross County Cup Final song. Now we're just a few days from a live recording of the track at The Ironworks in Inverness, the distribution deal has been arranged with top Scottish record label The Music Kitchen - owned incidentally by Stuart "Woody" Wood of Bay City Rollers fame - and we've now even managed to get the artwork togethe ready for the weekend newspapers! 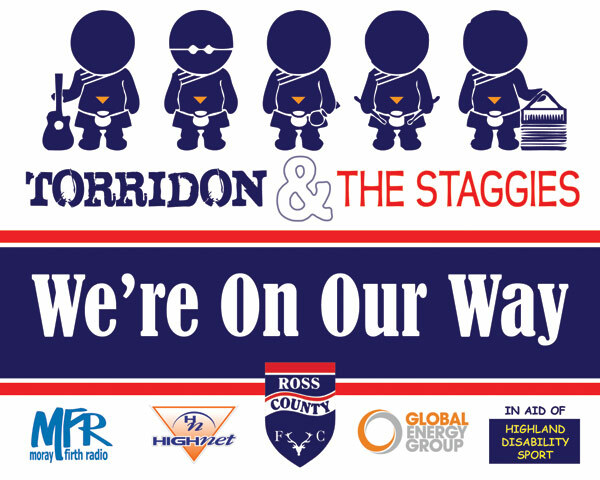 Torridon already have a pretty cool logo already and almost at first look we had an idea of how we'd take it forward. We had to take the track title "We're on Our Way" and make that prominent as well as building in the team colours, sponsors logos and yet not lose the feel. We also needed to think about the track listing for iTunes as well to ensure that the fans can look back in fifty years time and say that they were named on a top forty chart hit! So the band title for the track quickly became Torridon & The Staggies - Ross County's nickname and now a famous Highland live act! We took the wee Torries and gave them three Adidas stripes (size 41 Bambas would be nice thanks) the main sponsors logo and away we went. So that was it. From briefing to logo in about four hours. We hope you like the results.